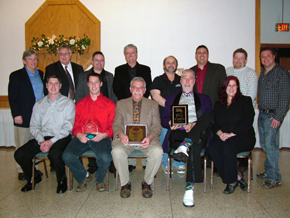 Home » 2012 Minutes » MSPA well represented at Annual MARFC Banquet! MSPA well represented at Annual MARFC Banquet! The Michigan Automobile Racing Fan Club is proud to be part of the Michigan Speedways Promoters Association. It is an important thing that race fans and promoters understand what it takes to help keep our sport alive here in the state of Michigan. The input we as fans give the promoters on what we like in racing and how much we are willing to pay for this form of entertainment is very important to both sides. At the Annual MARFC Banquet held this past weekend MARFC presented the MSPA with a special appreciation award for their service to the racing community and our club. With over 18 track & series promoters on hand at the banquet it truly shows that they are behind all of us race fans and racers in committing to help keep our sport of auto racing around for many years to come. They are not in this sport to make the big bucks because it takes big bucks to maintain their racing facilities each year. They do it because the love the sport as much as we do as racers and race fans. We should be proud that Michigan is the only state that has this kind of association in the country. Each year they attend the National Speedways Work Shops in Daytona and have been asked to speak to other promoters about what they do as a group. Back here in Michigan they meet twice a year to discuss track insurance, race rules, and what it will take to keep the fans coming back to each of their racing facilities each week. These are just a few of the reasons why MARFC presented the MSPA with this special award this year. Congratulations to the MSPA and wish them much success through out the 2012 racing season. Previous post ARCA Co Founder Mildred Marcum Passes Away! Next post From the Desk of the President for February!